Ready for another recipe straight from my childhood? 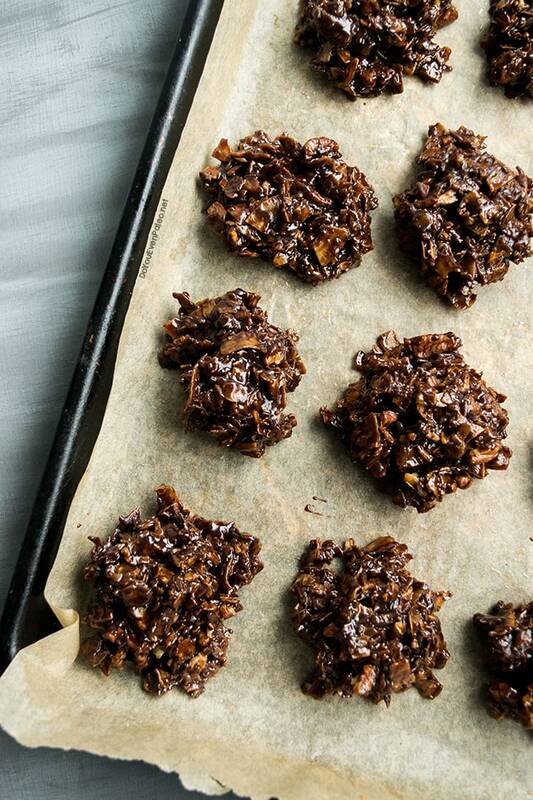 These No Bake Cookies were a go-to for a chocolate fix year-round. But we always made them at Christmastime. Not only do they make a quick and easy addition to the holiday treat smorgasbord, these cookies are also one of my brother’s favorites. 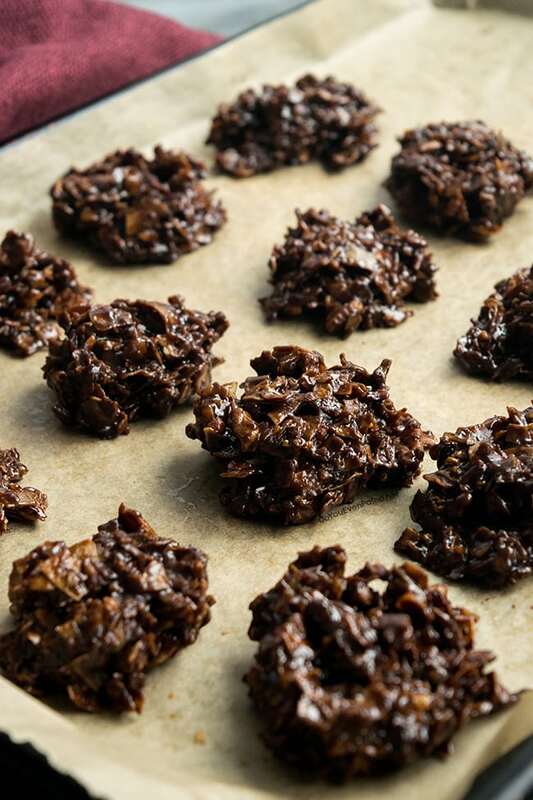 Of course, the original no bake cookies we made were full of cane sugar and oatmeal. So I asked my mom for a copy of the recipe we used growing up and paleo-ified it. Honestly, the recipe we used as kids surprised me. I could have sworn our recipe used chocolate chips, but it turns out the chocolate mixture is made entirely from scratch. Unfortunately, it also involves a couple ingredients I wouldn’t dare touch anymore: margarine and the mysterious “syrup” (which I can only assume in corn syrup). 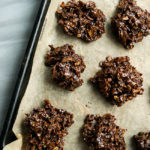 Luckily, even though the ingredient list seems long, these no bake cookies only require a few minutes of active kitchen time. There’s a reason these were a go-to at our house! 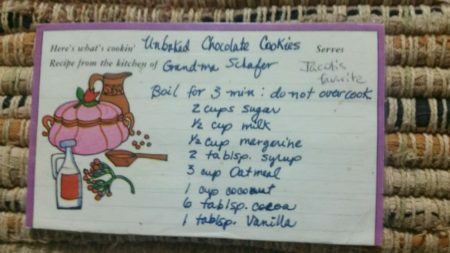 Often, we skipped actually making cookies and instead simply ate heaping spoonfuls of the mixture out of the pot, each armed with our own spoon. Ah, the memories. When I told my mom I wanted the recipe so I could make a version for the blog, she made sure to let me know that her recipe originally comes from her grandma’s kitchen. My grandma then altered that recipe slightly to suit her tastes and the tastes of her 10 kids. Once my brother, the first grandson, was born, these cookies were quickly labeled his favorite. And I altered the recipe again. The changes are pretty basic, honestly. Sugar becomes coconut sugar. Milk becomes coconut milk. Oatmeal becomes coconut…and so on. I also halved the recipe, so this makes about two dozen cookies rather than a massive four dozen batch. When I made them, I toasted the coconut and pecans. But technically, that means they aren’t “no bake” cookies anymore since you’re using the oven. So…toast if you wish! Toasted coconut/pecans will make for a crunchier cookie. Not toasting makes a chewy cookie. Also, if nuts aren’t your thing, feel free to use additional coconut flakes in place of pecans. Either way, this recipe is quick and satisfying. Enjoy! Add coconut milk, ghee, coconut sugar, maple syrup, cacao, and vanilla to a medium pot and bring to a boil. Boil for 3 minutes, then remove from heat. Immediately add coconut flakes and pecans, and salt, stirring until completely coated in the chocolate mixture. For crunchier cookies, toast the coconut flakes and pecans first. Preheat oven to 350 degrees F. Spread coconut flakes and pecans out on a baking sheet. Bake for about 5 minutes until the coconut flakes have browned slightly. 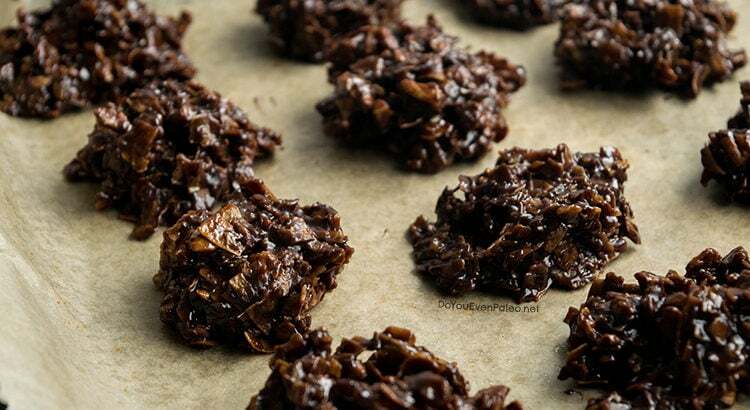 Pingback: 50 of the Best Paleo Cookies Recipes - You'll Want Them All! Is there any way to make these without coconut? I hate coconut lol. Thanks! The original recipe uses oatmeal instead of coconut. For a paleo version, though, you could try slivered almonds or some other chopped nuts – I haven’t tried those subs, but in theory the result would be similar! I made these just last night and absolutely love them! Instead of butter or ghee I used coconut oil and it came out delicious. These are so chocolatey and decadent. They’re better than the real thing and healthier too! Thank you for this recipe. Thanks for a great paleo treat 🙂 i am cautious with sugar, due to diabetes. After tasting your recipe – so good – I tried them with less coconut sugar. They are too crumbly. I will experiment, but hoping you might have a suggestion, since you are the expert. I had these at a friend’s place, so good. With diabetes i tried reducing the coconut sugar, but the result was crumbly. Wondering if you had a suggestion? I see similar recipes with nut butter, but i like your version with nuts better. Thanks for great recipes! Hi Trish! I don’t really have a suggestion for reducing the sugar, as I’ve never tried it before. You may be able to use honey – since it’s stickier, it might hold together a little better? Greetings Chelsea ! I would love to try this recipe, but the only sweetener allowed on my special diet is RAW HONEY. Your ingredients list includes coconut sugar and maple syrup, which I cannot use. Do you (or others) have any thoughts on how I can work this recipe with raw honey ? Hi, Susan. You could possibly sub in honey for both the coconut sugar and maple syrup, but I haven’t tried it myself so I can’t guarantee it will turn out! Don't subscribe All Replies to my comments Notify me of followup comments via e-mail. You can also <a href='https://www.doyouevenpaleo.net/comment-subscriptions/?srp=2092&srk=87505361eee98908ddf6ccb8681f50d6&sra=s&srsrc=f'>subscribe</a> without commenting.